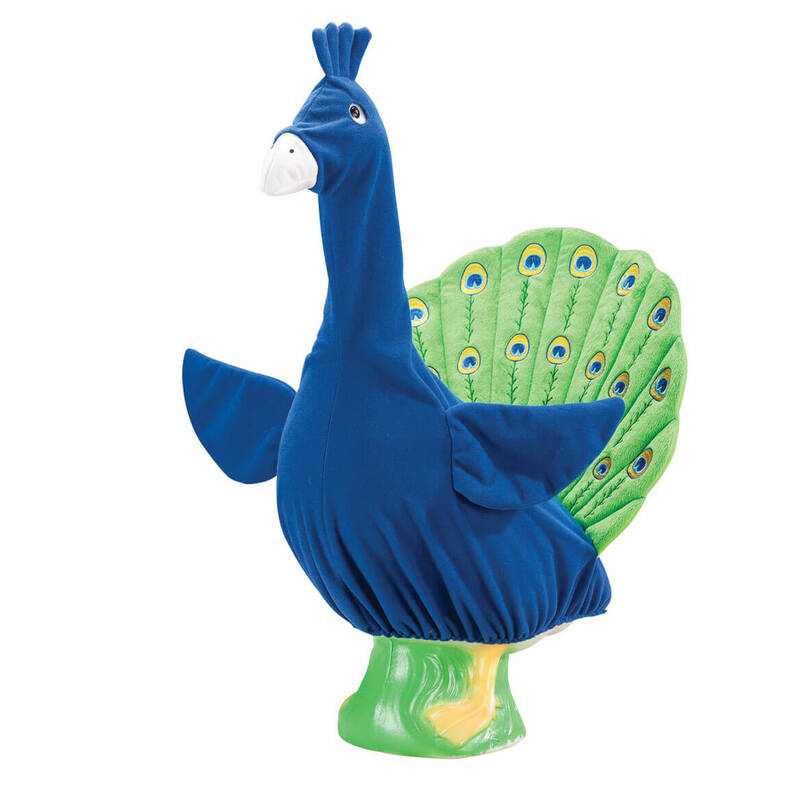 Update your lawn goose in strut-worthy style when dressed in this bright peacock goose outfit. Bold, brilliant and only found here, the fun, fancy outfit boasts embroidered green plumage that stands arched and upright—giving your goose the grand swagger he’ll love showing off! Polyester; for indoor/protected outdoor use. Spot clean. Imported. 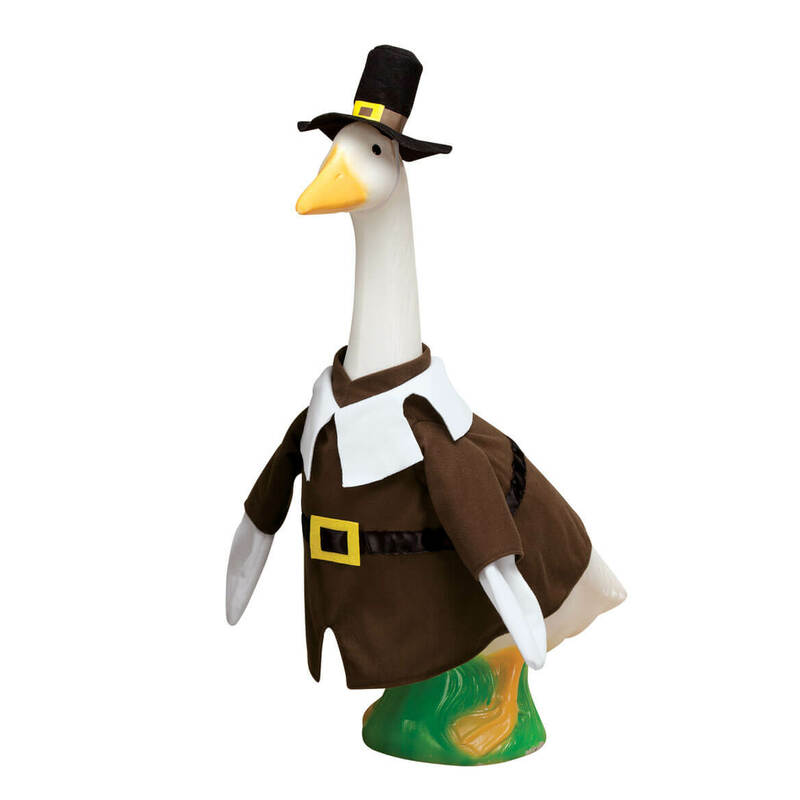 Get ready for fall with this boy pilgrim goose outfit for your yard geese. He wears a brown Pilgrim suit, white collar, gold belt buckle, top hat with matching buckle 16 1/2″ long x 11 1/2″ wide x 1 1/2″ high. For indoor and protected outdoor use. Get ready for fall with this girl pilgrim goose outfit for your gander. She wears a brown Pilgrim dress, white apron, collar, modest bonnet, 16 1/2″ long x 11 1/2″ wide x 1″ high. Goose costume for indoor and protected outdoor use. 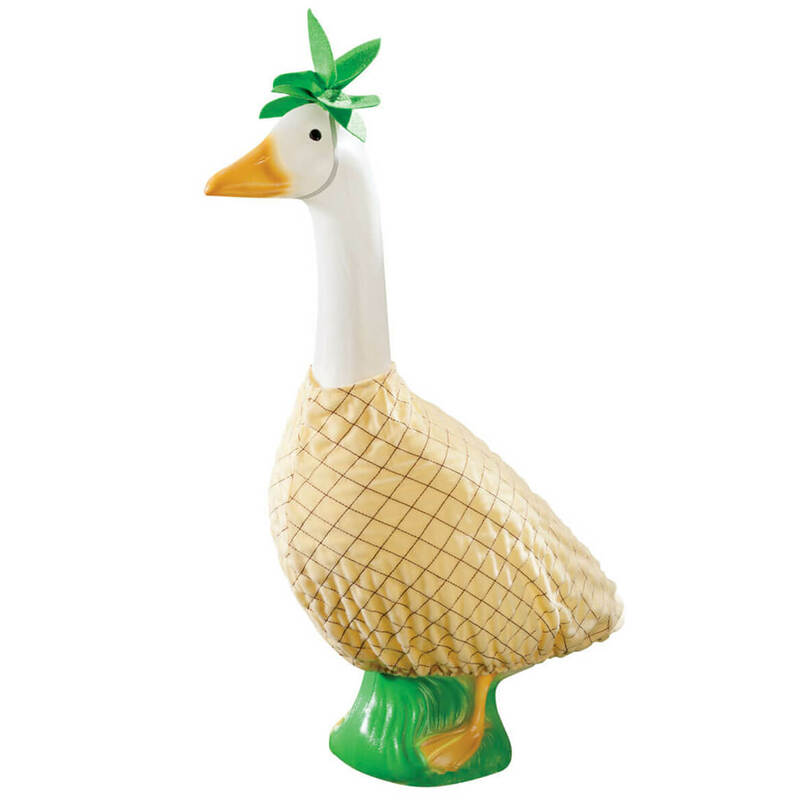 Transforming your lawn goose into a tropical trendsetter, our pineapple goose outfit serves up fresh summertime style! Brightening poolside or patio with a touch of island charm, a pineapple also symbolizes hospitality—offering warm “goose welcome” for porch or entryway. Our exclusive two-piece goose costume features a soft yellow tunic with cross-hatch pattern and green “leaf” cap for added fun (fitting securely with elastic band). Polyester; for indoor/protected outdoor use. Spot clean. Imported. When days get shorter and nights get cooler, dress your goose in fun fall style with this pumpkin goose outfit! 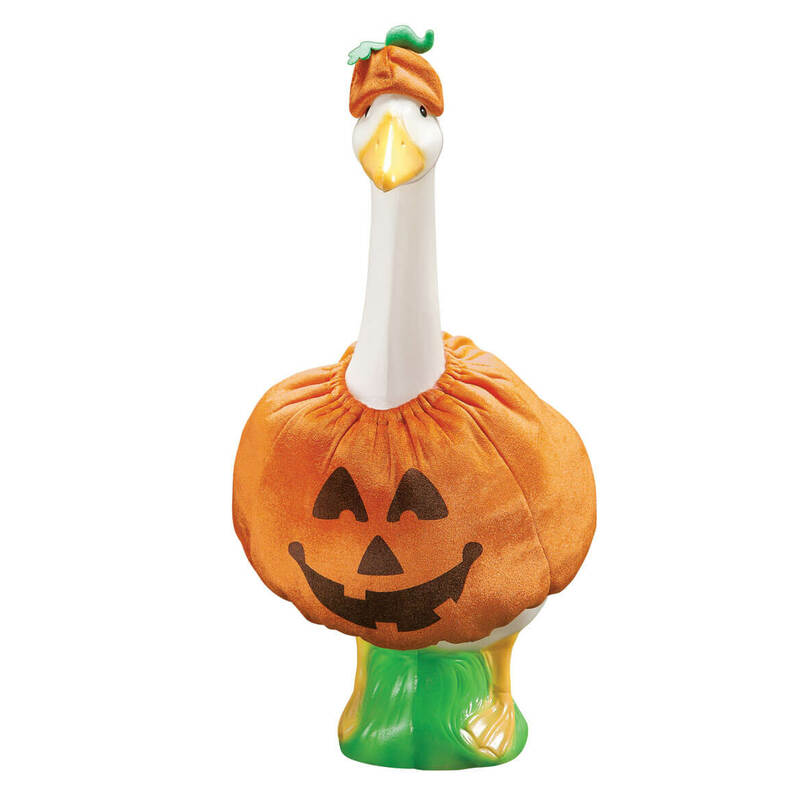 That cute goose peering out of the pumpkin’s top and wearing the lid deserves a prize. 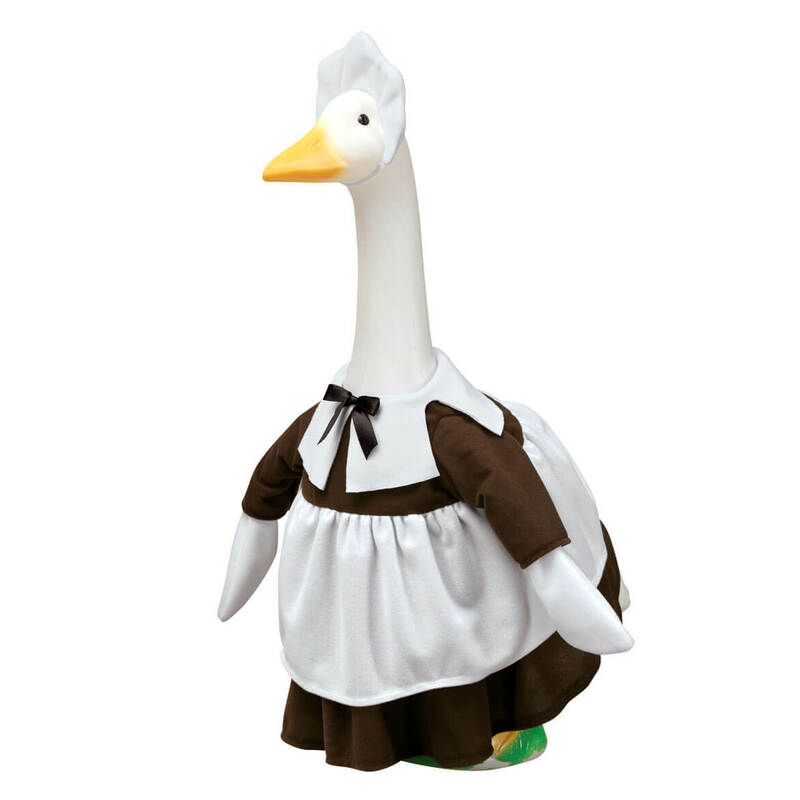 Goose costume is polyester with elastic hat straps. For indoor and protected outdoor use. ’Tis the season to be merry, so let your goose join in the holiday fun, dressed as jolly old Santa Claus! 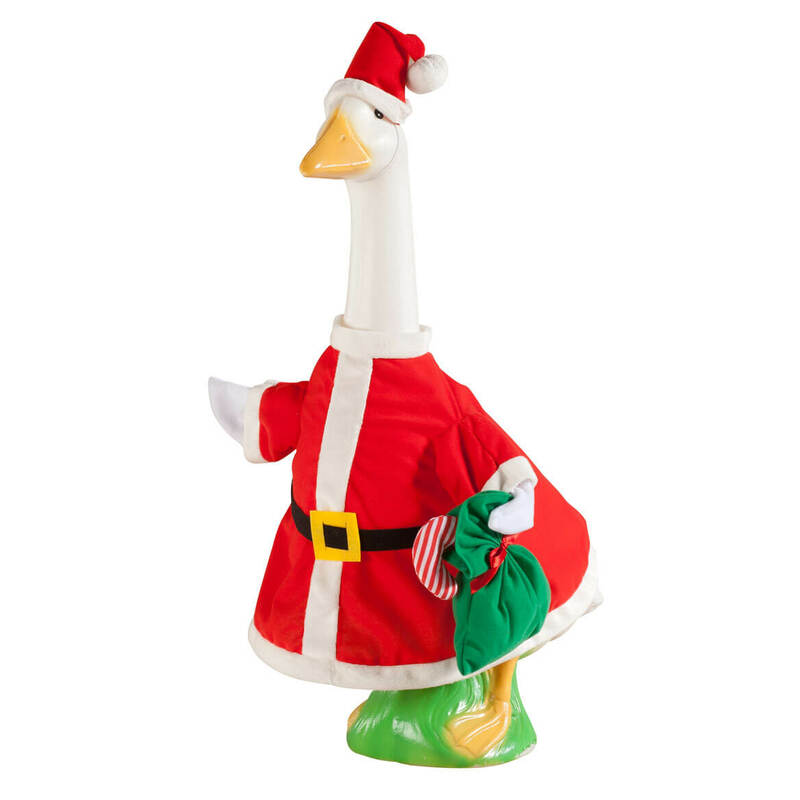 Designed to fit our Large White Goose (sold separately), our delightful Santa goose outfit is a holiday classic in soft red and white fleece, complete with black felt buckle, tassled cap with elastic strap and toy sack that’s thoughtfully attached so it stays in place. Polyester goose costume; for indoor/protected outdoor use. Imported. 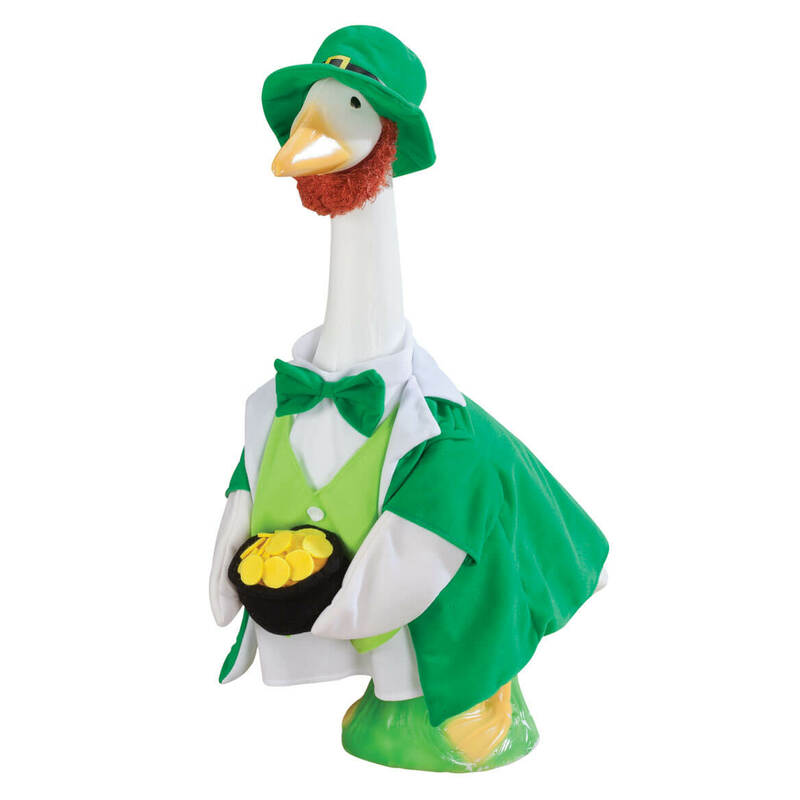 Bring the charm of the Irish home when you dress your lawn goose as a lucky leprechaun—complete with bow tie, bearded hat and his own pot of gold. Our exclusive leprechaun goose outfit creates St. Patrick’s Day magic only found here (and Irish or not, you’ll love it each year!). Polyester; for indoor/protected outdoor use. Spot clean. Imported. 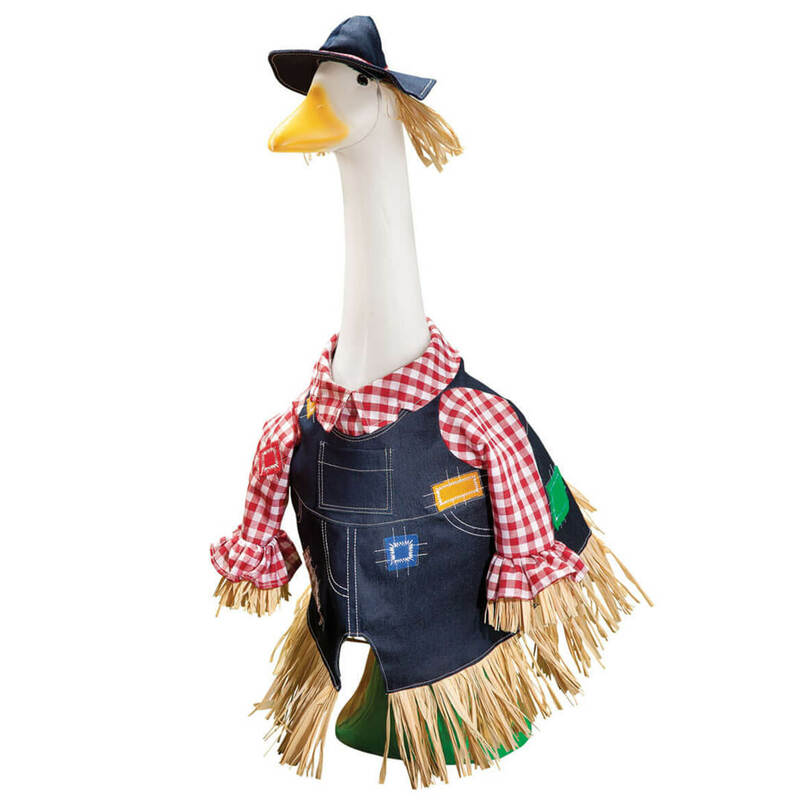 When days get shorter and nights get cooler, dress your geese in the fun fall style of this scarecrow goose outfit! Scarecrow lawn goose outfit features denim overalls, plaid shirt, floppy hat and corn leaves all around. Goose costume is for indoor/protected outdoor use. Polyester. Imported. 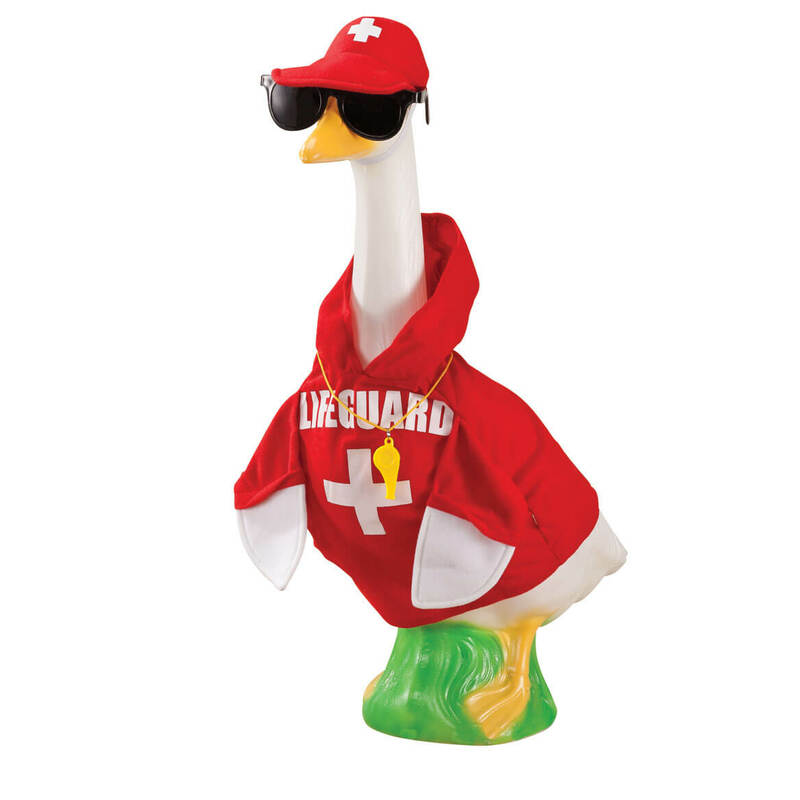 Ready to brave the billowing surf, patrol the pool and celebrate summer, your lawn goose will inspire smiles wherever he’s stationed—decked in our exclusive lifeguard goose outfit. Featuring red hoodie with attached whistle and matching hat with attached sunglasses, this goose costume is certified FUN for your favorite Kimball goose! 100% polyester; for indoor/protected outdoor use. Imported. 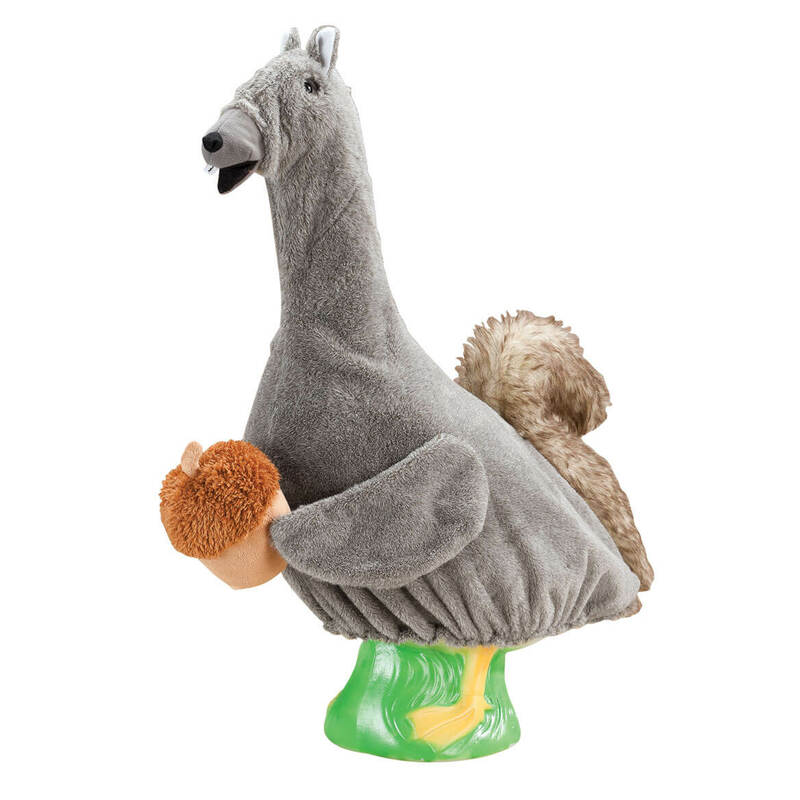 Transform your lawn goose into a furry grey squirrel, and keep the real rascals guessing! Complete with big, bushy tail and chunky front teeth, our squirrel goose outfit includes one jumbo plush acorn for a touch of nutty fun … inspiring smiles, all season long. Polyester; for indoor/protected outdoor use. Spot clean. Imported.